We respect our colleagues, customers and guests and treat them as we want to be treated. We have confidence in each other’s skills and intentions. 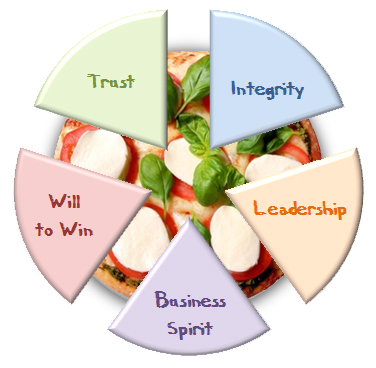 We uphold the values and principles of the Flavour of Italy Group in every action and decision. We always refer to data and intellectual honesty when presenting our proposals or valuing possible risks. We are leaders in our area of responsibility with a deep commitment in sharing and spreading our results. We use all our resources to achieve leadership objectives and strategies. We accept personal accountability to meet our business needs, improve our systems and help others improve their efficiency. We all act like owners, treating the Company’s assets as our own keeping in mind the long-term success of the Company. We are determined to be the best at doing what matters the most. We have a healthy dissatisfaction towards the status quo. We have a compelling desire to improve and to win in the market.